Assisted by rich industrial experience and immense knowledge, we are able to manufacture Powered Roller Conveyor. 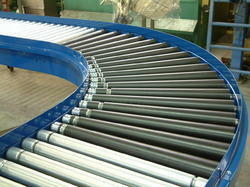 We are successfully meeting the requirements of our clients by manufacturing the best quality range of Roller Conveyor. Keeping track with latest market development, we are devotedly engaged in manufacturing a wide assortment of Roller Conveyors. Owing to our enriched industrial experiences, we are devoted towards manufacturing a wide variety of excellent quality Roller Conveyor. The stainless steel structure of Roller Conveyors adds to the structural integrity. The belt is fitted with equal spaced roller that causes the movement. Our company is engaged in exporting and supplying an extensive range of Roller Conveyors in Vapi, Gujarat, India. We manufacture this range of conveyor using optimum quality raw material, sourced from vendors of high repute. We provide them at very nominal rates. To help industry convey light or heavy goods, Om Sai Enterprises offers custom roller bed conveyors. These roller conveyors are available in both chain- and belt-driven models. Our modern infrastructure equipped with advanced equipment, helping us to provide the best quality range of Roller Conveyor. All roller conveyors are ruggedly constructed for dependable operation and are available in a variety of standard roller bed conveyor configurations. 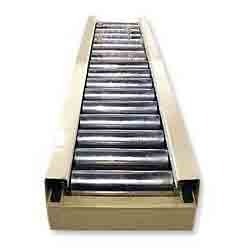 Our domain expertise has enabled us to offer an excellent collection of Rollers Conveyor.